Please join the City of Carlsbad in thanking and honoring N.M. 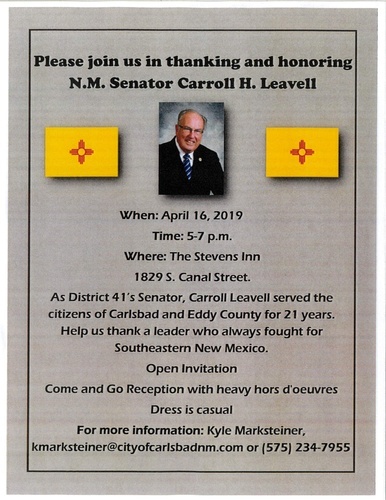 Senator Carroll H. Leavell on April 16th from 5:00 to 7:00pm at The Stevens Inn, 1829 S Canal Street. As District 41’s Senator, Carroll Leavell served the citizens of Carlsbad and Eddy County for 21 years. Help the City thank a leader who always fought for Southeastern New Mexico.